As the US and Europe push forward with continued sanctions against Russia, an intriguing economic battle is taking shape, one which will have significant repercussions for years to come. While Washington and Brussels seek to divide Russia from Europe in order to maintain Western hegemony – blocking Eurasian integration by definition – Moscow is counteracting this strategy by leveraging its economic power in the form of energy exports and cooperation. Although most of the economic machinations have flown under the radar, being less headline-grabbing than the conflict over Ukraine, extended sanctions, or the NATO military buildup, in reality they are equally important. Russia’s energy giant Gazprom has entered into economically and strategically critical deals with key western companies at precisely the same moment that the West seeks to isolate Russia economically. Simultaneously, Russian-sponsored gas pipelines in the North and South of Europe (as well as in Central and East Asia) complicate matters for those who would seek to alienate Russia from the European market and the potential political and economic power that access to that market brings. From a geopolitical and strategic perspective, Russia’s ongoing conflict with the US and its European subordinates is being manifested as much in the boardrooms as in the halls of parliaments; as much under the Baltic and Black Seas, as in the war rooms of the Pentagon and Kremlin. Amid the panels and discussions about the development of BRICS, Eurasian integration, and New Silk Roads at the St. Petersburg International Economic Forum, a massive energy cooperation deal was signed, one that should be seen as a major coup for Moscow. An agreement between the world’s top gas producer, Russia’s Gazprom, and Royal Dutch Shell, to build two new Nord Stream gas pipelines to Germany will have major implications for the future of economic cooperation between Russia and European energy firms. Moreover, it will further cement Russia as an integral partner for German industry, the heart of the Germany’s economy. Documents of such significance are signed only once every five years or maybe even 10… Many of our traditional partners are positioning themselves as strong regional players… Shell is a global player. And as the global gas markets develop… we will be creating a global strategic partnership… We know about Brazil, Australia and about the Asian market. And that allows us to talk about a global partnership… Our level of readiness is very high. It is clear that, purely from an economic perspective, such partnership between Gazprom and Shell and its partners will have global implications. It will allow for expansion of the joint Gazprom-Shell liquefied natural gas (LNG) offshore project Sakhalin-2, which only reached its full capacity in 2014. Such an expansion will make the already successful project even more of a player in providing much needed energy to the growing economies of the Asia-Pacific region, as well as its customers in North America. Considering the high costs of transport for LNG, the strategic location of the project, as well as the recently agreed expansion of the joint Gazprom-Shell operation, Sakhalin-2 is poised to make Russia a critical supplier for the region’s LNG needs in the years to come. The agreement will also provide for major upstream asset swaps, an industry term for cooperation in exploration, feasibility studies, preliminary drilling and testing, and other early stage processes. Essentially, this would make Gazprom and Shell into interconnected partners in a number of key respects, not simply in terms of energy production and export. The importance of this point should not be understated because, unlike simple supply contracts which can be renegotiated, allowed to expire, or terminated, this sort of cooperation is a longer-term process, and with the massive amounts of capital investment into upstream assets, would make any significant changes due to political circumstances far less likely. In short, Russia would have a more concretely guaranteed partner; insurance against negative political developments. Of course, the deal with Shell is not the only major economic development in terms of energy in recent months. The much publicized Russia-China gas deal announced a year ago is beginning to bear fruit beyond the obvious propaganda coup that it was. Gazprom Deputy Chairman Alexander Medvedev recently announced that China will begin construction of its leg of the Power of Siberia gas pipeline on June 29, 2015. With Russia already having started construction of the pipeline on its territory back in September 2014, the project looks to be on target for the on-stream date of late 2017. The significance of this development should not be understated as a cursory look at the pipeline map of Gazprom’s eastern projects demonstrates clearly that the Power of Siberia project, along with the other pipelines already in place, will position Russia to be a major provider of energy both to China via the soon-to-be constructed gas processing and gas chemical facilities at Blagoveshchensk on the Russia-China border, and to other East Asian countries. In addition to these important eastern energy developments, the imminent construction and incorporation of the Altai Pipeline could make Russia-China energy cooperation into a full-blown energy alliance. Projected to supply 30-38 billion cubic meters of Russian gas from Western Siberia to China, the pipeline would cement Russia as China’s premier economic partner in terms of energy. Not only is it the sheer volume of gas that Russia would supply, but the location, running south directly into Urumqi, the capital of China’s Xinjiang province, and the hub of many of China’s New Silk Road plans. In this way, Russian energy will become a principal driver of Chinese economic development and expansion. More broadly, it makes Russian gas and Chinese production the twin driving forces of Eurasian integration. Naturally the political importance of such interdependence is somewhat self-evident, as economic partnerships quite often translate into political and strategic ones. And it is in the realm of politics where these economic arrangements are especially vital for Russia. Russia’s strategic imperative with regard to Europe is clear: do whatever it takes to prevent the US from effectively driving a wedge between Russia and Europe. As Washington has shown in the last 18 months, it will stop at nothing to sever any cooperation that it can between Moscow and its European partners. From fomenting war in Ukraine, to pushing for sanctions and escalating its NATO forces, the US is clearly doing everything it can to draw a clear dividing line in Eastern Europe in an attempt to create a de facto “iron curtain” separating Russia from both political and economic partnerships in Europe. Seen from this perspective, the deal with Shell is a clear countermove. Rather than simply being content with counter-sanctions, Moscow is attempting to drive its own wedge into Europe by becoming an important partner with Royal Dutch Shell, one of the most powerful and influential European corporations. While the US is creating a geographical wedge, Russia is obviously creating an economic one; the deal will divide European political leaders beholden to US diktats from European business leaders beholden to profits and investors. Because of the profitability of trade with Russia, it will become far more politically unfeasible for the European establishment to go along with moves against Russia as it will further put them in conflict with their own business elites. At the same time, Russia is undergoing its own pivot to Asia, expanding dramatically its economic relations with China in a number of areas, including military/defense technology transfer, as evidenced by the news that Russia will be selling its much prized S-400 missile systems to China, making it the first country to receive the technology. So, Russia and China simultaneously become energy and military partners. Though they may not use the term “alliance,” that is precisely what this is. 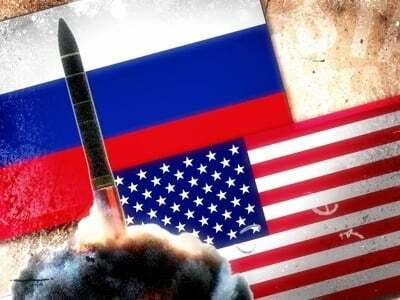 In this way, the economic war begun by the US and its toadies has now created the ultimate blowback, a full on economic blitzkrieg by Russia. Of course, it didn’t have to be this way as Russia was clearly happy to rake in the profits of continued cooperation with Europe pre-Ukraine crisis. But, now that push has come to shove, the Russians have shown that they are simply unwilling to be on the receiving end of an economic war. Rather, they are now unveiling their big guns, the sort of arsenal for which US-NATO has little defense. Eric Draitser is an independent geopolitical analyst based in New York City, he is the founder of StopImperialism.org, exclusively for the online magazine “New Eastern Outlook”.